This website uses third party applications to improve user experience. Processing personal data and purposes of processing when registering for events or requesting an offer or using the contact form for tenders. The processing of data takes place upon your request and is within the framework of answering a contact request supported by our legitimate interest pursuant to the first sentence of point (f) of Article 6(1) GDPR. The personal data collected by us when you use the contact form will be deleted after completion of your query. The used Google tools helps us to provide you a better user experience. More information about Google cookies here. Please adjust your browser settings according to your cookie preferences. Please note however, cookies can be an essential part of user experience online. The Ecodesign Learning Factory is a training programme for developing innovative products and services. 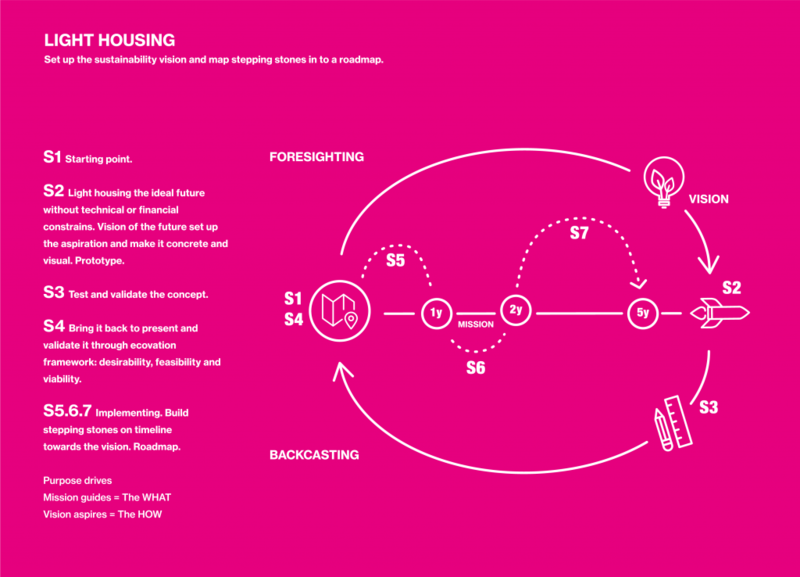 Our practical approach focuses on bringing forward the circular economy opportunities by emphasizing design thinking and life cycle thinking. The user-centric ecodesign tools and methods will help you to minimize the environmental impacts while maximizing the benefits for all stakeholders. Learn the basic approach and tools how to solve ecological challenges at a system level. Two-day Ecodesign Training for individual professionals in product and business development. The training is organized twice a year. Seats are filled in the order of sign ups. Learn to apply the ecodesign tools and methods to solve the challenges of your organisation. Private Ecodesign trainings are organized for companies and teams who want to learn together. A private Ecodesign Training is organized for transdisciplinary teams within companies or members of organizations. We support your entire organisation in the transition to the Circular Economy. Customized Ecodesign Sprints are designed to organizations that want to tackle specific ecodesign challenges and deploy Circular Economy within the organisation's processes. Everything is tailored based on your needs. Early bird prices expire a month prior to the event. We have authored and adapted multiple useful tools and principles to assist the ecodesign process. You get to experience how these tools are used at our training events. Please find three of our handpicked tools below. Rest can be found at the Sustainability Guide. This material is available under the Creative Commons Licence “Attribution - NonCommercial – ShareAlike 4.0 International (CC BY – NC - SA 4.0)”. If you would like to use the material commercially, please contact Fraunhofer IZM, Berlin at lernfabrik@izm.fraunhofer.de. Extending the useful life of products is about more than just recycling materials. It is about keeping a product as close as possible to its original state over time, for instance through longer use, repair, upgrading, refurbishment or remanufacturing. This work is licensed under a Creative Commons Attribution-NonCommercial-ShareAlike 4.0 International License by Fraunhofer IZM 2018. Tapani Jokinen. Max Marwede. This work is licensed under a Creative Commons Attribution-NonCommercial-ShareAlike 4.0 International License by Fraunhofer IZM 2017. Tapani Jokinen. Max Marwede. This work is licensed under a Creative Commons Attribution-NonCommercial-ShareAlike 4.0 International License by Fraunhofer IZM 2018. Florian Hofmann. Tapani Jokinen. Max Marwede. Integrating ecodesign practices and lifecycle thinking! Choosing an ecodesign challenge and understanding the critical aspects. Understanding the problem and sustainability opportunity based on discovery insights. Generate ideas to solve the defined problem. Build a circular product-service system (PSS). Ecodesign Sprint based on ´Design Sprint Methods` developed by Google Ventures. "Participating in the ‘Learning Factory for Ecodesign’ for me especially turned out being worthwhile in the point of knowledge about and methodical approaches for combining different viewpoints on Ecodesign to a holistic approach, not only having single aspects like technology, economics and sustainability as usual." "Today many companies want an agile product development process. These more effective methods can be adopted at the Ecodesign Learning Factory. Furthermore companies learn how to incorporate environmental aspects into their product development. The programme was intensive but generated long term sustainable value for my company." "Joining the Learning Factory Ecodesign was enlightening towards the role of design regarding its influence on our product environmental impact. It provided hands on tools to implement the approach into the business context. In addition, it was a great chance to meet an interesting bunch of people." The workshops at the Fraunhofer IZM on the topics of closed-loop production and ecodesign are led by an interdisciplinary team. A very good approach from a design point of view. Two-hour workshops provide an initial idea of what design methods can achieve. Ideas and business models for the development towards a circular economy can be deepened in two-day workshops and tested playfully for their feasability. Meet Tapani, Max, Christian and Florian - the authors of the Ecodesign Learning Factory programme - who facilitate training modules and innovation workshops as well as teach circular design principles in seminars and conferences. Research Fellow at the Fraunhofer-Institute for Reliability and Microintegration (Fraunhofer IZM). Freelancing consultant for ecodesign of products. About MaxThe past decade Dr. Max Marwede has been supporting companies in designing sustainable products through the facilitation of innovation workshops, the development of ecodesign requirements and through technology roadmapping. Furthermore, he consults German and European public authorities on future ecodesign regulations. As a researcher he currently develops an easy and practical way to integrate sustainability into the product development process. Chief Design Officerat Circular Devices. About TapaniTapani Jokinen is an internationally recognized Strategic & Ecodesign expert. His 25 years extensive experience in design gives him a unique insight in managing complex business, driving sustainability-led innovation and developing sustainable products and services. By integrating design thinking with life cycle thinking, Tapani helps companies to accelerate the transition from a linear to a circular economy. Besides his work as a Design Consultant at Fraunhofer IZM, he is the founder of TJ-Design, a creative consultancy that fuses strategic innovation and design with sustainability and ethical business practices. Furthermore, he is Chief Design Officer at PuzzlePhone Ltd. Prior to this he was Head of the Design Portfolio and Strategy at Microsoft / Nokia, where he was a designer behind the iconic Nokia 3310. About ChristianChristian has been working at Fraunhofer IZM as a research scientist since 2017 and at Technische Universität Berlin since 2013. Prior, he worked on a project involved with the sustainable introduction of electric mobility in China. At Fraunhofer IZM, his expertise is in environmental assessment and optimization of electronics equipment in the framework of various publicly and industry funded project. He also works in the context of European substance regulation and elimination efforts of hazardous substances from electronic devices. Between 2016 and 2018 he worked as an external consultant to the European Commission on material efficiency aspects of computers to aid the revision of ecodesign requirements. About FlorianSince October 2017, Florian Hofmann has been doing his doctorate in the research group “Obsolescence as a challenge for sustainability”, which is a five year transdisciplinary project consisting of scientists from the Fraunhofer IZM, Center for Technology and Society as well as the department Nano Interconnected Technologies (both Technische Universität Berlin). The Heinrich-Böll Foundation, the green political foundation in Germany, financially and ideationally supports Florian Hofmann for his research. He is also a board member of the Gesellschaft für Nachhaltigkeit e.V. (association in the context of sustainability transitions of the economic system) in Berlin. New products and technologies have to comply with an increasing range of strict specifications, and at the same time have to be cost-efficient and environmentally friendly. The Department Environmental and Reliability Engineering supports technological developments until they reach market maturity with environmental and reliability analysis reaching from nano-characterisation level to evaluation and optimisation at the system level. Ecodesign trainings organized at Fraunhofer IZM can also take a tour at our on-site small scale “factory” – the so called Start-a-Factory. This is a modularly structured development and manufacturing laboratory for startups and SMEs. The tour should help participants to understand ecologic impacts during the manufacturing phase. The idea is to link the theoretical ideas, gathered during the training, with practical insights. Ecodesign Learning Factory was developed within the EU-project EcoDesign Circle by ecodesign experts from Fraunhofer IZM and Circular Devices during 2016 and 2017 commissioned by the German Environment Agency and cofunded by the Interreg Baltic Sea Region.